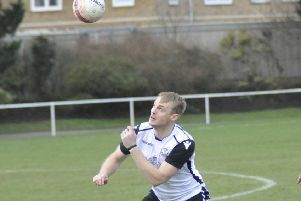 Hastings & Bexhill Rugby Club’s first team was beaten away to table-topping opposition. H&B lost 24-5 away to London Three South East leaders Crowborough on Saturday and slipped two places to ninth in the 12-team division as a result. In what was always going to be a tough game, the unavailability of several key players because of injury added to H&B’s selection problems and they therefore fielded a team showing several changes from the previous weekend’s good home win against Lewes. The game kicked-off in cold, wet conditions which only worsened as time wore on. The ball was slippery and the ground greasy, handling errors from both teams were a feature of the afternoon. Chris Geary, playing in the second row, was yellow carded for offside and from the ensuing penalty move, Crowborough scored a try which was converted to take an early lead. The home side built a solid 17-0 half time advantage and H&B’s difficulties increased at the end of the first period when Frazer McManus was sin-binned for a late tackle. After the break, H&B played with more venom and organisation. The home defence came under continuous pressure, but Crowborough held out. Had H&B scored during this time, there might have been a different outcome. Rob McManus replaced Geary in the second row, Jake Stinson came on for Ben Campbell and Tom Waring made way for Stash Maltby at full-back. Waring was soon called back into action because Bruce Steadman had to leave the pitch with a rib injury. During one of their rare second half incursions into the H&B 22, Crowborough were awarded a penalty try because the visitors were adjudged to have pulled the ruck down. Whether this was because of the conditions or Crowborough simply overpowered them is a debatable point, but what was certain were the injuries to Joe Umpleby and Nick van Herpen. Both had to leave the pitch, with Geary and Campbell coming back on and playing in the scrum. Despite this enforced reorganisation, H&B continued to put the well-drilled Crowborough defence under pressure and were eventually rewarded with a well-worked try from Tim Sills. The hard-won ball was whipped through the backs to put the flying winger into space for a good try. Waring’s conversion attempt hit the post. Crowborough deserved their win having played a controlled and organised game. They contained the H&B attack with strong tackles and launched four successful attacks of their own. H&B are without a game tomorrow (Saturday) and will return to action at home to Vigo on Saturday October 20. Hopefully the week off will allow the injuries to heal, and for the team to return fit and ready for another tough contest.